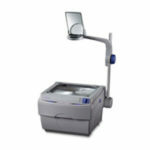 The overhead projector is an older type projector used for displaying content from previously prepared document printed on paper or special foil by means of light source, magnifying glass and mirrors. These projectors are still in use in some schools and businesses where presented material could not be digitised. What is a Digital Data Projector? 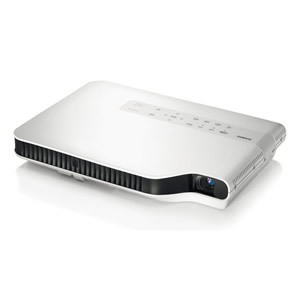 Digital data projector refers to any projector that connects to a laptop or a PC. It was first used to differentiate the old type slide projectors from the ones that connected to PCs. The slide projectors are now regarded, as obsolete and all modern projectors are in fact digital data units. It’s the expected operating time for the lamp when first installed. A projector lamp life span is measured in hours. The average lamp life is 2500-3000 hours and may vary depending on the projector make and model. 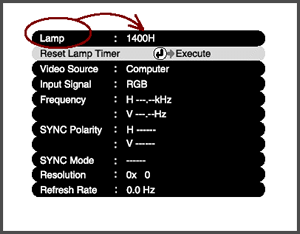 Check the remaining lifespan of the lamp by accessing the Lamp section of the menu of your projector. To extend the lifespan of your projector lamp always operate the projector in a relatively dust free and well-ventilated area and make sure that you clean the filters regularly. You can also use it in the ECO mode but his will reduce the brightness of the picture slightly. You can access the ECO mode from the main menu of your projector. When to replace a projector lamp? The first indication that your projector lamp needs replacing is usually the image displayed losing in its brightness and sharpness. 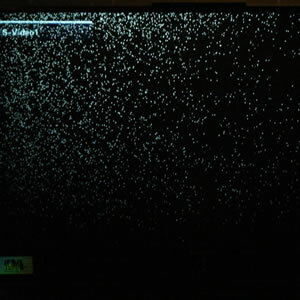 You can also experience flickering of the image and in the very end the projector will simply turn itself off. You can check when to replace the lamp (bulb) next by accessing the menu of your projector and looking at the ‘Lamp’ section. You will find there the remaining or already used-up lamp hours, depending on the model. What is a projector bulb and projector lamp/ lamp module? A naked bulb is the delicate light source component that is highly susceptible to damage. 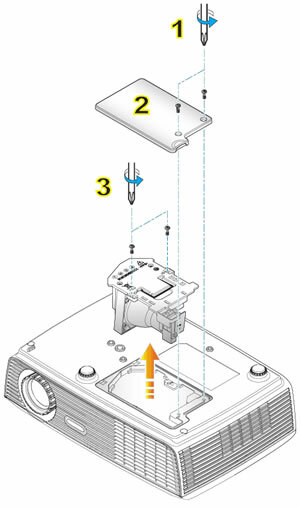 The bulb has to be placed into the housing first and then the so created module can be installed into the projector. Due to the nature of the bulbs, it is recommended that specialists only replace these, as it is extremely common for the bulbs to shatter and stain when handled without due care deeming them unusable. A projector lamp is a special bulb fixed into a housing, which allows for the replacing of the module to be a swift and relatively easy task. The lamp/ lamp module is the whole unit assembled in sterile conditions of the lamp factory and it is a ready-to-use module requiring minimum technical knowledge when replacing old-for-new in your projector. How To Replace Projector Lamp? Make sure that your projector is disconnected from power and laptop and that it is cold. 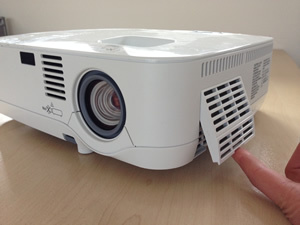 Never carry out any maintenance work on a projector that has just been turned off and is still warm to touch. It is a relatively easy task and can be done by anyone with basic technical skills. The lamp is fitted in the projector in an easy to access fashion and the module itself is built to make the replacement process quick and effortless. ￼Note: If you are looking to replace a naked projector bulb, you are likely to require ￼a qualified technician to do it. The bulbs are extremely delicate and easily. ￼Using the screwdriver, remove the screws securing the door. ￼￼Identify the lamp module and using your screwdriver, remove the screws securing ￼it. ￼Remove the lamp module using the provided handle or grips. You will find these on ￼the module itself. ￼Replace the old module with the new one using the handle or the grips provided,￼making sure that you do not touch the lamp bulb or the lens of the projector. ￼Using the screwdriver, secure the lamp module in place with the screws. ￼Place the lamp door back in position and using the screwdriver, secure it with the ￼screws. ￼Power the projector on and reset the lamp timer in the ‘Lamp’ menu of your ￼projector. How to clean Projector Filters? vacuum cleaner. Just remove the filter(s) and remove the dust. One of he filter is always located next to the lamp. ￼Note: Your projector may have more than one air vent containing filters. When ￼carrying out maintenance, make sure that you locate and clean all of your ￼projector’s filters! ￼Identify where the filter/filters are. 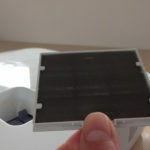 ￼Unlock the filter flap and remove the filter.￼Remove the filter and inspect it for any dust and dirt. ￼Remove the filter and inspect it for any dust and dirt. ￼Clean any dust and dirt from the filter using an air can or a vacuum cleaner. ￼Check that the filter is properly clean.You will be able to see through it when holding up to the light. ￼Replace the filter and make sure it is securely in place. What is a Lampless Projector? A lampless projector is a term used to describe units fitted with hybrid laser as source of light rather than traditional high-pressure lamp. The advantage of this type of projector is that the light source life span is between 10000 and 20000 hours and means that the lampless projector will require virtually no maintenance. What is display or projector resolution? The display resolution, whether it is in projectors, TVs or computer monitors, describes the number of distinct pixels in each dimension with which the image is displayed. It is expressed as width by height (W x H) with the units in pixels. The resolution is often described by acronyms like SVGA, XGA or WXGA. There are various different resolutions available and it often feels overwhelming trying to find the one that is right for you. Below, you will find all of the available resolutions. The most popular resolutions in business and home cinema are XGA, SVGA and WXGA and the main difference between them is the level of detail displayed. The SVGA is only able to display about 65% of the details that WXGA displays. For comparison, see the pictures of the 3 types. Note: The different resolution in projector will mean that the picture may be stretched and fuzzy or be very small. The rule of thumb is that the lower the resolution, the less sharp and accommodating the display picture will be! ￼The aspect ratio of an image describes the proportional relationship between its ￼width and its height. ￼There are 4 main aspect ratios used in business and home entertainment. To choose the aspect ratio and the right screen for you, contact us for further advice. is the classic format used by first computers and its popularity was developed to match the then prevailing digital displays of the time. It is used as a standard business projection format for PowerPoint presentations as well as Excel sheets and others. Is the classic widescreen format used by most TVs and entertainment projectors. It was developed to accommodate the rapid advancement in video technology allowing for the cinematic experience to be enjoyed in privacy. This format is recommended for home cinema and business, requiring high level of detail to be visible in the presented material. ￼Is the standard computer resolution of the modern computers and it is ￼recommended for gaming and business, requiring high level of detail to be visible ￼in the presented material. How to connect a projector to a laptop/PC? 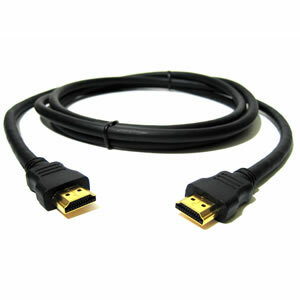 To connect the projector to your computer, choose the display cable you are going to use and connect one end to the relevant port on the projector and the other to your computer. 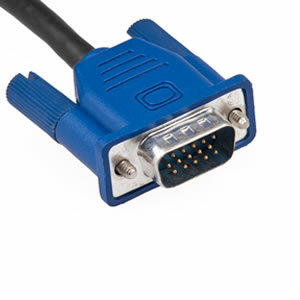 Both ends of the cable are identical and there is no significance in the sequence or direction you connect them in.Projector should automatically detect the connection and pick up the feed from your computer. 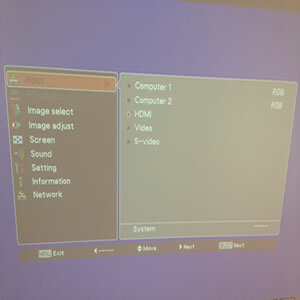 However, when connecting to older units, you may need to manually select the source in the menu of your projector. The projector will now display a mirrored image on your computer screen. Why do I see snow/dust on my image/screen? If you see snow or dust like interference on the projected picture, the likely cause is a faulty DLP chip in your projector. 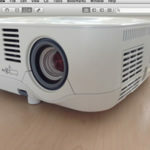 Your projector will need to be repaired or replaced. If the projector is less than a year and no older than 3 years old, you will need to contact the manufacturer of your projector with its, make model and serial number to establish whether the fault can be repaired within the warranty terms. If your projector is older than 3 years, it is outside the warranty period and the repair cost will need to be estimated by the manufacturer. 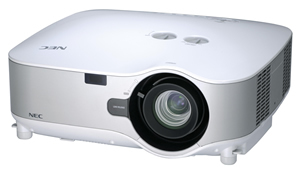 ￼Note: In many cases, the cost of replacing the DLP chip closely matches the cost ￼of a new projector. You might consider a new and often upgraded unit for the same cost. Why is my image dark and/ or flickering? If you see that the image projected is not as bright as it used to be, it is likely that the lamp is reaching the end of its life or that there is an issue with the display connection cable. You will need to check the cable connection and remaining lamp life in the ‘Menu’ to establish the cause. If you all seem to be in order and the problem persists, contact us for further advice. Why is my projector not turning on? ￼Is your power cable plugged in correctly? ￼Is the power socket on the wall switched on? ￼Is there an indication (any lights on) that the power is reaching the projector? If you checked all of the above and all is in order, please check the filters of your projector. It is likely that they are not allowing enough air for the fan ventilation due to dust and dirt. 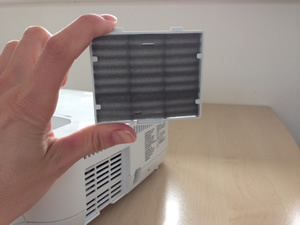 If your filters have not been cleaned recently, follow the How to clean Projector Filters? of this Knowledge Centre. 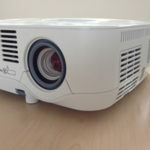 If your projector is still not turning on, contact us and we will advise you further. Why is my projector turning off? The most frequent cause of the projector turning itself off only after few minutes from turning it on is the blockage to the air intake of the cooling fan. In such case, you will need to power the projector off, wait until it is completely cooled down and clean the filters. If your projector continues to turn off after a few minutes from turning it on, please contact us and we will advise you further. How to Calibrate my TeamBoard? The calibration of the T2 and T3 models is the first step that you must take when initially connecting any laptop or PC. It is also required if the projector used with the TeamBoard has been adjusted in its position. ￼Make sure that the TeamBoard, the projector and your laptop are powered on and ￼that all the connections between the board, the laptop and the projector are in ￼place. ￼Go to the TeamBoard Draw Suite in the Hidden Icons on your laptop. It’s the small ￼upward arrow located in the bottom right corner of your screen. Click on the ￼TeamBoard Software icon. ￼A menu will appear. Hover the mouse over ‘Calibrate’ option. 3 calibration options ￼will appear. Go through each option in turn starting with ‘Whiteboard’, then ￼‘Interactive’ and ‘Action Bar’ as last. ￼You will now calibrate the ‘Whiteboard’. To calibrate ‘Whiteboard’, select this option ￼from the‘Calibration’menu. You will now see a small cross in the centre of the board and will be asked to touch. ￼You will now be asked to touch the top left and bottom right corners of the board.￼You should touch the board as instructed at the corner points of the displayed. ￼You will now calibrate the ‘Interactive’. To calibrate ‘Interactive’, select this option ￼from the ‘Calibration’ menu. ￼You will now see a grid of lines on your screen. Touch all points where the lines ￼cross as accurately as possible. The order you touch them in is not relevant. You will now calibrate the ‘Action Bar’. To calibrate ‘Action Bar’, select this option from the ‘Calibration’ menu. You will now be asked to touch the left and the right ends of the action bar at the bottom of the board. The action bar is not a displayed image but a board feature. The calibration of your TeamBoard is now completed and you are ready to use it interactively. Why is my Interactive Board not working? ￼Your interactive whiteboard not working is most likely due to one of the below. If all your connections are in place and the image is still not appearing on the board, it is likely that there is a fault with the projector. If the projector is not working, please refer to ‘Why is my projector not turning on?’of the Knowledge Centre. ￼This issue may occur with any interactive whiteboard and depending on the make ￼of your board there are different ways of fixing it. 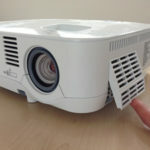 If your TeamBoard shows no interactivity after connecting it and the projector to ￼your laptop, there are 3 common reasons. You either have no software on the ￼laptop you are using, the laptop USB connection is not working or the board is calibrated correctly. You will need to check the USB port of your laptop to diagnose and check if you have the required software installed. It is likely that you will need the TeamBoard Draw Suite software and WizTeach.You can upload both from www.teamboard.com/software. If you already have the required software, have verified the license and are still unable to achieve the interactivity, try a different USB port on your laptop. You may also check the surface of the board for any dirt residue or damage and make sure that the image from the projector fits inside the board frames. If the image is not perfectly fitting the board, you will need to have it readjusted and the board will have to be re-calibrated. To calibrate your TeamBoard, please refer to How to Calibrate my TeamBoard? of the Knowledge Centre.To clean the surface of your TeamBoard, use a soft damp (it must not be dripping wet!) cloth or a board cleaner.If you have followed all of the steps above and are still unable to achieve interactivity, contact us and we will advise you further. If your SMART Board is not interactive you will be required to contact the manufacturer direct. Depending on the model of your SMART Board, different ￼steps may need to be taken.￼Visit www.smarttech.com and click on support to choose the topic you require help. If your Promethean board is not interactive you will be required to contact the manufacturer direct.Depending on the model of your Promethean board, different steps may need to be taken.Visit www.prometheanworld.com/us/english/education/support/ and choosethe topic you require help with.If you require a Promethean replacement pen, wand or any other accessory, visit our Resource4Learning Shop. If you have checked all of the above and they seem to be in order, please cross check a different eBeam Pen with your eBeam Unit. Please note that you cannot interchange the eBeam Classic and eBeam Edge Pens. If a different pen worked with your unit, it means that your pen is faulty and will need to be replaced. If a different pen did not work, your eBeam unit is broken and will need to be replaced.For replacement eBeam Pens and eBeam Units, visit our Resource4Learning Shop. Note: The Touch IT board will only work with a 32-bit computer. If you have a 64-bit ￼machine, you will not be able to use it with the Touch IT board! To check if you ￼have a 32 or a 64-bit machine, go to ‘My Computer’ and ‘System Properties’ and look for ‘System Type.